Perhaps the farthest Elgin in the continental United States from Elgin, Illinois is Elgin, Oregon. 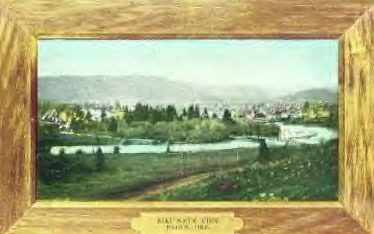 Also known as "The Jewel of the Blue Mountain", Elgin, Oregon was founded by William Hamilton in 1885, who also served as the first postmaster. Hamilton named the city after a popular song "Lost on the Lady Elgin" that his nephew and niece frequently sang. Among its other historic treasures, Elgin, Oregon still boasts its Opera House, which was founded in 1912. The Opera House, which once featured plush draperies, box seats, an orchestra pit, elaborate backdrops and a rococo décor, now shows first run movies daily. With a population of 1750 residents, Elgin, Oregon is a popular location for such outdoor sports as fishing in Looking Glass Fish Hatchery, hiking along Historic Oregon Trail, or skiing at Spout Springs Ski Resort.